Opera used to burst with somewhat odd but charmingly ambitious features it almost certainly didn’t need. The browser’s last major release, Opera 12, took a welcome step away from all that clutter, while keeping a handful of innovations and all of its charm. By replacing its home-brewed rendering engine with a mélange of Chromium and WebKit, Opera 15 has now gotten slightly better at keeping pace with rival browsers—but it also feels bland and anonymous, a Stepford-wife version of its former self. A revamped Speed Dial page is also now the only way you can get to your bookmarks. Unlike browsers from Yandex or Maxthon, this isn’t some hasty reskinning of Google Chrome. Opera’s designers have taken pains to give the browser a curvy, metallic look that’s nothing like Chrome, and at least somewhat distinct from Safari or Firefox. Opera 15 has also made notable improvements to Speed Dial, the palette of favored pages that appears when you open a new tab. It’s now easier than ever to reshuffle those pages or combine them into groups, which pop up in a scrollable subpane of webpage thumbnails. But though this looks great, it doesn’t let you see all the sites you’ve saved in a group at the same time—just however many can fit in the current view. A heart icon (the Stash feature) in the new combined URL and search bar lets you save a page in Speed Dial for later reading—a more visually appealing version of Safari’s Reading List. 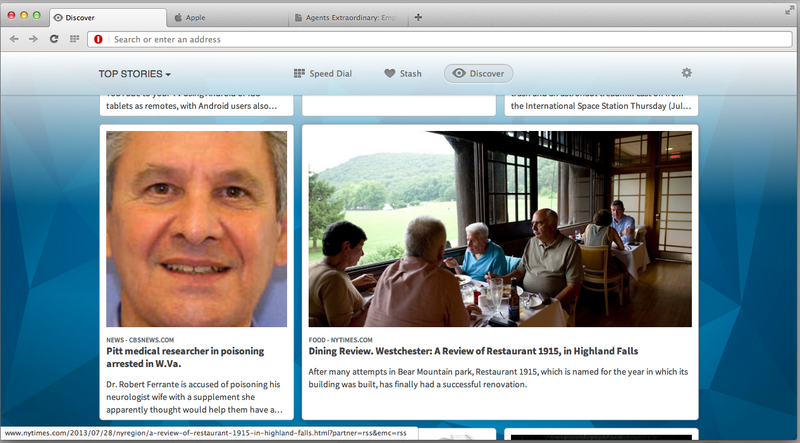 And a Discover option under Speed Dial summons an array of recent news stories, customizable by region or subject matter. 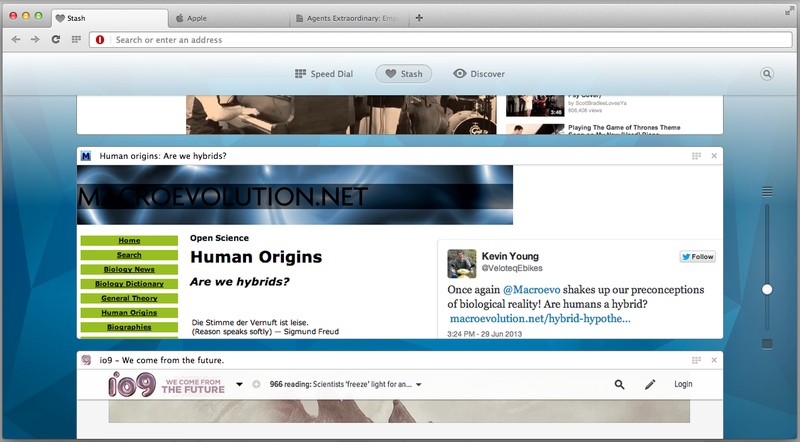 Opera 15 does a much better job of culling worthwhile stories than do browsers like Sleipnir 4. Also included in Opera 15 is a clever Password Manager feature, which allows you to easily see and control which passwords Opera stores. The browser also offers Off-Road mode, which is a refinement of its previous ability to compress webpages for faster loading on slow connections. When I activated it on my fast connection, I saw neither a notable speed boost nor any visible degradation in the images I loaded. Found an intriguing link you just don’t have time for? Opera 15’s Stash option lets you easily save it for later. Who are you, and what have you done with Opera? 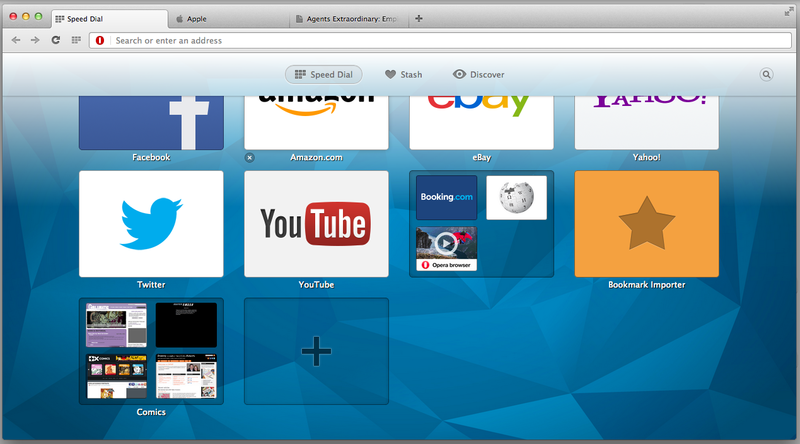 For every impressive new feature it has gained, Opera has lost a bit of its earlier spark. Some absences are minor but still missed, like visual tab previews; others are real losses, like Opera’s excellent mail features, which have at least been spun off into their own application. What’s more, the bookmarks bar is completely gone. Instead, Opera 15 forces you to browse bookmarks via Speed Dial—but only after you’ve moved them there using a Bookmark Importer tool. I found that solution much less elegant and convenient, and resented that the program forced me to do things its way, rather than giving me options. Unlike other browsers’ news aggregators, Opera’s Discover pane actually seems to work pretty well. Still in need of a tune-up? When run on a 2GHz aluminum MacBook with 2GB of RAM, and tested against Opera 12 and the latest versions of Safari, Firefox, and Chrome, Opera 15 bested only Firefox in HTML5 vector graphics tests. It scored far closer to its rivals in HTML5 bitmap graphics tests, but still came in third. And it placed second to last in HTML5 text rendering. In all three categories, Opera 15 lagged Opera 12, in one case by more than 25 percent, and in another by nearly 50 percent. In regular use, Opera handled just fine. It loaded pages quickly, scrolled crisply, and didn’t crash or otherwise give me any hassles. I’m hardly clamoring for a return to Opera’s everything-and-the-kitchen-sink days. But I miss having Opera as a quirky, delightful beacon of individuality amid an increasingly similar selection of browsers. In that regard, Opera 15 feels a bit disappointing. However, its performance has improved and it’s still a very capable browser. Opera 15 is speedier and less cluttered with features than previous versions of the browser, but it has lost some of its charming individuality in the bargain.